Do you have a favorite summertime potluck dish? I do and you are looking at it! I’ve been making quinoa salad in one form or another for years. I like to play with the beans, veggies, and herbs I add based on what I have in the house/what’s in season. Black beans are definitely my preferred bean, and as soon as fresh local corn starts to make an appearance in markets around here, corn is pretty much a must. I’ve added basil on occasion but cilantro is definitely a better fit with the other elements in this particular salad. If you are as yet unfamiliar with quinoa, it’s a seed that’s native to the Andes region of South America. I ate it several times when I was recently in Peru, cooked in a stew. While it behaves like a grain, quinoa is actually more nutritious than most grains because it is high in protein, iron, and calcium. Quinoa is also gluten-free. Quinoa seeds are coated with a bitter substance so you need to rinse quinoa very thorough before cooking. Moreover, quinoa benefits from a several hours-long soak in water in order to deactivate the naturally-present enzymes that bind up the nutrients within. For this reason, on days when I am planning to cook quinoa, I like to place it in a large bowl and cover it with water for 2-3 hours. Then I pour off the water, and rinse the quinoa in a fine mesh strainer before proceeding to cook it. As I mentioned above, I love bringing this salad to potlucks because it's easy to throw together and it feeds a crowd. I also like to make it just for my family, though, ensuring leftovers I can snack on all week long. 1. Combine rinsed quinoa and water in a large pot and bring to a boil. Cover and reduce the heat to a simmer. Cook for 10-15 minutes, until all of the water has been absorbed. Turn off the heat, add the corn, and keep covered for another 5-10 minutes. Fluff the quinoa/corn mixture with a fork and allow to cool slightly. 2. While the quinoa is cooking, combine the rest of the ingredients in a very large bowl. Add the cooked quinoa/corn when it has cooled and stir to combine. Taste and adjust seasonings, if necessary. Serve at room temperature or chilled. Thanks Aggie! I did eat it almost every day for lunch this week! I’ve never soaked quinoa before but I will definitely try it the next time I cook some. Thanks for the tip! Definitely not a necessity, but I do it whenever I remember. I completely agree, black beans, corn and cilantro. Though I have had those three together often. What a quintessential pairing. For some strange reason I have never tried it with quinoa, but now that you’ve mentioned it it sounds like perfection. 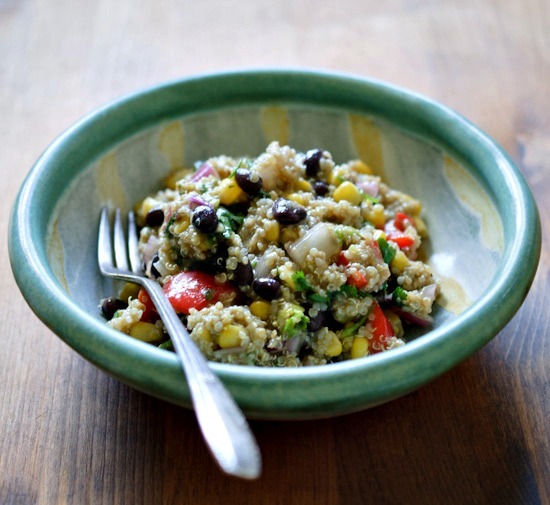 I agree, quinoa salad is perfect potluck fare. I tend to make mine with cherry tomatoes, basil, roasted red peppers, walnuts, a bit of lemon juice and zest, olive oil. Sometimes olives or artichokes make it in too. Next time, I’m making yours. Your version sounds incredible, Nikki! Such a simple and delicious looking salad. 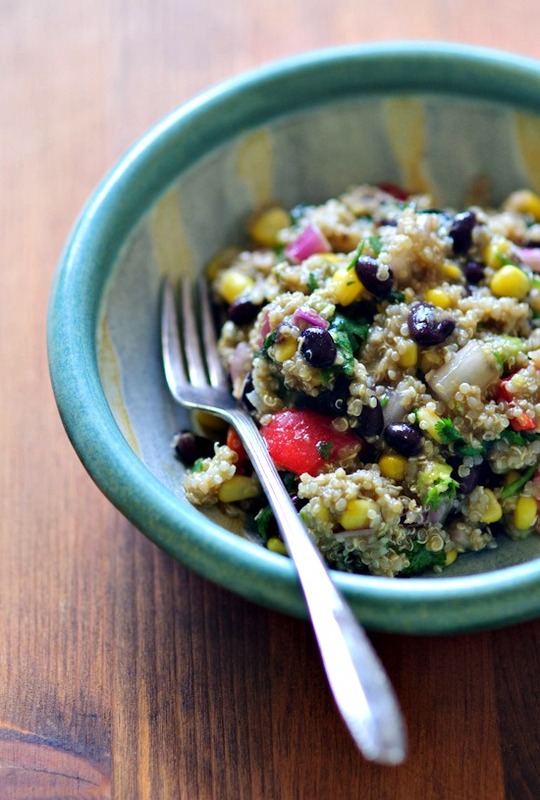 Quinoa is the perfect summertime salad ingredient. Absolutely delicious! Perfect for summer! Thanks for the inspiration! I was in a rut of same-old. 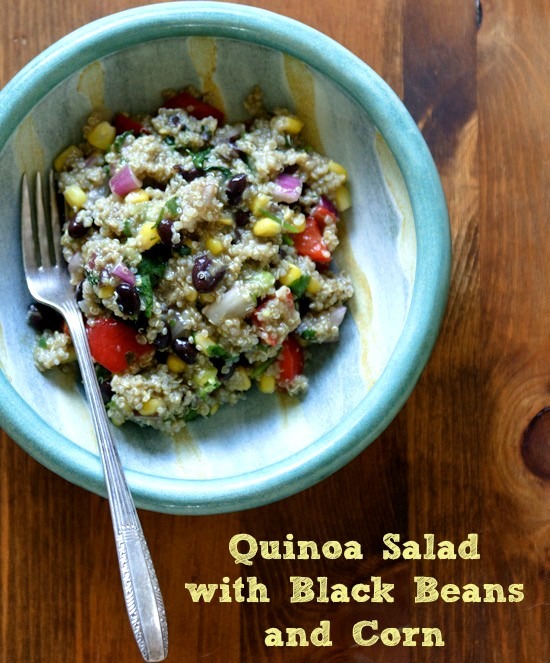 I soaked the quinoa as well–great tip! This salad was delicious! Thank you for sharing. I made it for a party and it received much love and praise. I made a few alterations to the recipe when I served it – used 4 cups of low sodium organic vegetable broth instead of water, and used most of a seedless cucumber in place of the avocado. I will be making this again!